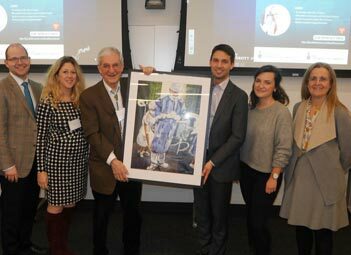 This year’s Balfour Lecture in Surgical Ethics celebrated the outstanding career of Dr. Martin McKneally. Martin has been a contributor to surgery and surgical ethics for several decades both locally and worldwide. In the engaging style of a master storyteller Martin addressed several themes that are unique to surgery: the definition of surgical ethics, surgical innovation, rethinking surgical consent and learning surgical ethics. He suggested that the surgical ethics is founded on “trustworthiness” which is defined by both competence and commitment. Both of these have a number of components but strikingly, “the immediacy of the surgeonpatient relationship distinguishes it from other caregiving experience”. This trust leads one to question when it is okay to try something new, and as Martin adds “on someone’s mother”. He discussed his journey through this and other questions leading to some of his landmark work on innovation. This work has provided guidance on the appropriate oversight for innovations and has been implemented very practically in our system, demonstrating the way in which one can begin with thinking about ethics and end in practical patient-centered solutions. He also helped us to understand the sometimes blurry boundary between research and innovation. Trust also leads us to reconsider consent, not as a list of ‘risks, benefits and alternatives’ but as a tool to garner the trust of surgical patients. He enlightened us on some work regarding high-risk surgery, and the patient’s perspective of what is important to them. This was linked to some of the problems encountered by clinicians who would like to discuss the challenging issue of life-sustaining treatment after surgery. He continued by raising the questions and challenging age-old assumptions about who should be having certain types of conversations and in what context. Finally, he highlighted the increasing importance of a focus on ethics training as an integral part of surgical training and paid tribute to old and new colleague and mentors, and of course his “managing partner Deborah McKneally and beloved family. We were delighted to have Martin be the third Balfour lecturer. He, as he always does, has raised the bar. Donald Church Balfour, 1882 – 1963, received his MD from the University of Toronto, interned at Hamilton City Hospital, and studied surgery at the Mayo Clinic. His father was president of the Balfour Tool Company. Donald devised and introduced numerous instruments – an operating table, operating room mirror for teaching, an abdominal retractor. He married Carrie, Will Mayo’s daughter, and spent his distinguished career at the Mayo Clinic. He became Chief of General Surgery and President of the Mayo Foundation for Education and Research. He received many honors and awards as a surgical educator and scholar. His family endowed the annual Balfour Lecture that celebrates his memory and brings distinguished scholars in Surgical Ethics to teach in our Department.